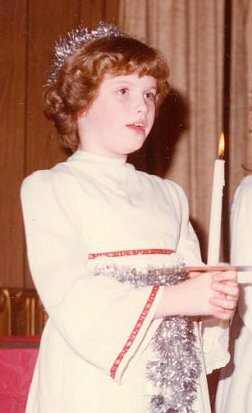 Over here, I started telling a story about participating in the St. Lucia Festival as a child. I’d like to talk about it a bit more. My great grandparents came here from Sweden. They arrived in Staten Island. Eventually, they ended up in Western Upstate New York. To illustrate the connection I feel with them – my great grandparents, their daughter/my grandmother and her husband, my parents, and Skotte and I were all married in the same church. The first two couples were married in the chapel, and the latter of us in the sanctuary. 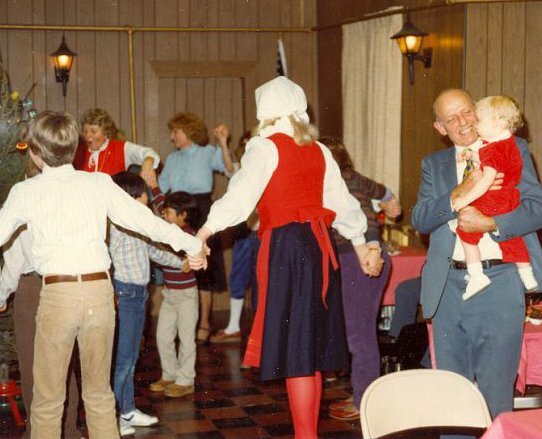 My great grandparents were charter members of the VASA Order of America in our city. 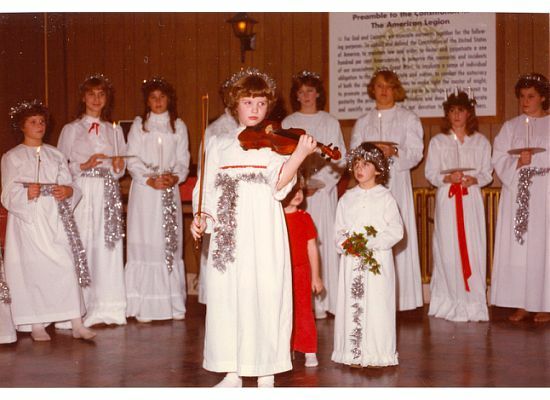 The Swedish Lodge hosted the Lucia Fest up until a few years ago. 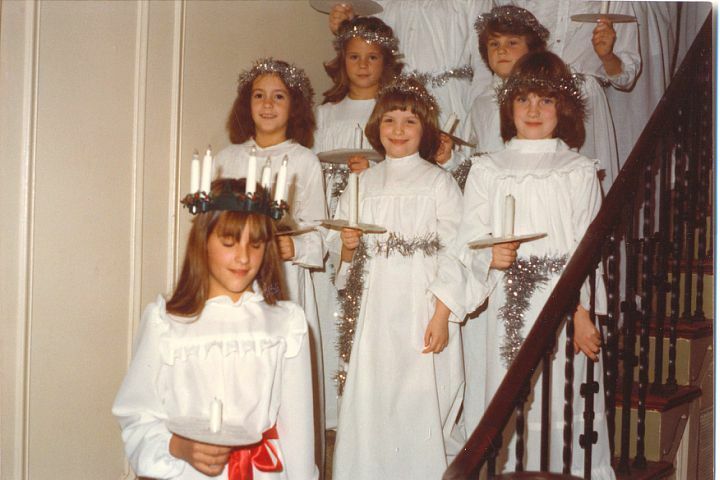 I was lucky enough to be the Lucia twice as a teenager. It was a BIG deal for me. My Swedish heritage is very important to me. Here is a picture of me participating in the festival. I am not sure how old I was when I first started. I remember going to the fest before I participated, though, so I might have been around six. In this picture, I am wearing my very favorite outfit, one with special embroidered trim on it. 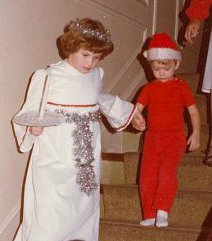 I remember waiting to be old enough to wear it, and then sad when I outgrew it. Here we are waiting for our candles to be lit, and then process into the hall singing this song. 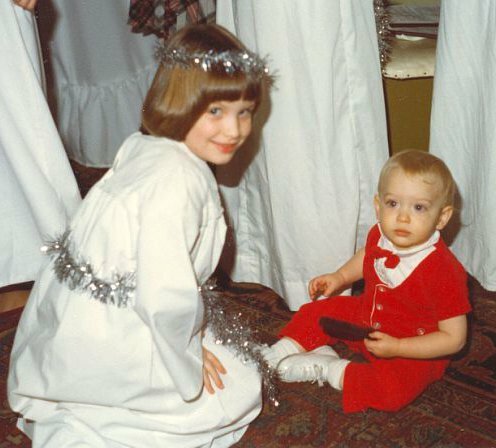 Other songs sung: Midnatt råder, It Came Upon a Midnight Clear, O Little Town of Bethlehem, and Silent Night in Swedish. Someone reads a poem in Swedish and then English, often an exchange student for authenticity. After we process out, then everyone sits down for a smorgasbord of COOKIES! The adults had the option to buy glögg. Santa would arrive and give us gold chocolate coins. Then the dancing would begin! The Lucia Fest is also where my love of accordions began, as we had *TWO* accordion players to accompany us. Here is a short video taken at one of the more recent fests. I hope you enjoy this small look at one family tradition I hold close to my heart. This entry was tagged lucia fest, st lucia. Bookmark the permalink. ← The Holiday Season has arrived!